The plan was simple: get to the tree, cut it down, and then make it into a bow. Bows are important in H1Z1 's early game, so I booked it as fast as I could to get to this lone Douglas fir in the field. Unfortunately, I had to run past a massive herd of undead to get here, making quite a bit of racket in the process, and they're getting closer as I bring out my axe. One swing into the trunk takes a chunk out, and another gets it ready to fall. But I'm making too much noise, and I can hear the shambling hordes behind me. A third whack brings the tree down and the zombies rushing. The bow I never made wouldn't be much help against so many flesh eaters, anyway. As I respawn on a hill overlooking yet another group of ghouls, Producer Steve George chuckles. “You're getting some pretty rough spawns,” he tells me. “What we want to do is get a bow in your hands as soon as possible.” I spin around and start moving toward a tree again, this time without bringing friends. With the tree down, I can finally put a ranged weapon together. Unlike DayZ , which emphasizes scavenging abandoned buildings for supplies, H1Z1's current build gives you some basic tools for crafting right from the beginning. Opening the inventory window and switching to the crafting tab shows me that I already know how to whittle wood logs down to planks and sticks. It even goes through some steps automatically for me—if I choose to craft wooden sticks, the game will first transform logs to planks, and then to the stick that I want. Another window helps me discover new recipes by comparing different materials. I take my survivor's shirt off and shred it into strips, and then put it in the discovery window with the wood sticks. Presto-chango, now I can make a bow. It feels more Don't Starve than DayZ, and lets me feel more powerful in H1Z1's Oregon woods than I ever have in Chernarus. A lot has changed since we last saw H1Z1 at E3 2014 . The world is more substantial—more wildlife in the wilderness, more towns and houses to explore. Crafting has been expanded, but it also feels as important as scavenging now. Quickly building a bow means I'm better prepared for facing the beasts—living and dead—in the game. I watch as a wolf chases down a deer, which George refers to as the “circle of life” AI programming in the game. The wolf pounces, kills its prey, and then turns on me. I hold the right mouse button to draw my bow and fire arrows with the left button. It doesn't feel natural—I expected to hold my left click before I shot—but I still dropped the wolf in one shot. I ask George how SOE would handle permadeath, thinking that I could lose the ability to craft this sweet bow the moment I meet a Zed. “The idea is that you lose anything you've gathered,” he tells me, “but any recipes you've learned stay within your system. So you don't need to learn how to re-craft a bow after you die.” The same will be true with items purchased through the game: you'll simply respawn with anything you've paid real money for. Also added, just in the past week, is the H1Z1 virus itself. SOE did not share many details, but you will have to manage your disease if infected, or become one of the shambling undead I kept fleeing. Some houses had pills that could help boost my immunity, and an indicator at the bottom right told me when I was infected, and to what stage the disease had progressed. It's a small thing that makes H1Z1 feel more game than simulation, much like how your health, thirst, and stamina are tracked in the interface instead of inferred through “you are hungry” messages and how hazy your screen becomes, but it works. 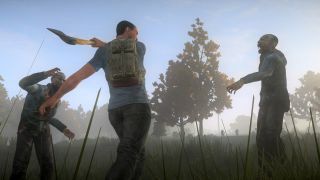 Unfortunately, the similarities between DayZ and H1Z1 extend beyond the setting and into the state of the game. It's still an extremely early build, and bugs were common. Items would refuse to move in the crafting windows. Clothing, once equipped, would refuse to unequip. The hitboxes for zombies are inconsistent, as is their pathing. I lost a pursuing zombie by running into a house that it couldn't enter, for some reason. The newly-added bears are nigh-impossible to kill, as I learned the hard way. I watched a single grizzly tear through a massive herd of undead, then it killed me in one quick swipe. Once I finally made it to a small town, I had to mash on the E button to get a door to open all the way. Getting it closed while fleeing from enemies could be a crapshoot. SOE is aware of all of these problems, and is uncharacteristically transparent about them. During my demo, the inventory interface failed to recognize items I was swapping, leaving me unequipped and unable to drop the buggy item. George said it was a new issue, and when the client was restarted, I was good to go. But the experience is indicative of why SOE still hasn't released the game in an early access form. When it is ready for early access, Whisenhunt tells me the game will be available for $20, much cheaper than initial access to Landmark. “We're going to monetize this game a little differently than we have in the past,” he tells me. “People get really nervous when we tweet something like, 'Hey, you get a premium bat for the SOE Live Pass.' And then people say we're selling weapons.” In reality, the premium items will be cosmetic, and SOE may experiment with gated access for gamemode-specific servers, with Whisenhunt specifically mentioning a “battle royale” server as an example. “You could play your way into that, or even purchase your way into that,” he says. Eventually, however, the game will be free-to-play. The big question, then, is when H1Z1 will be available on Steam, but SOE would only say that it will offer the early version “soon.” I think it should offer access now: even in its current state, I'm excited to see what lots of players will be able to do with the world.